I weighed myself this morning and I'm down to 220.0, which is 4 pounds lost since 10 days ago and 2 pounds since yesterday. I definitely did a little fist-pump this morning, because I'm pretty sure this is actual weight-loss and not just fluctuations. I've bounced between 223.0 and 221.0 for the past week, but this 220.0 is for real. I never thought I'd be so happy about a pound or two! The proof that there's a downward trend. It's not just in my head after-all! 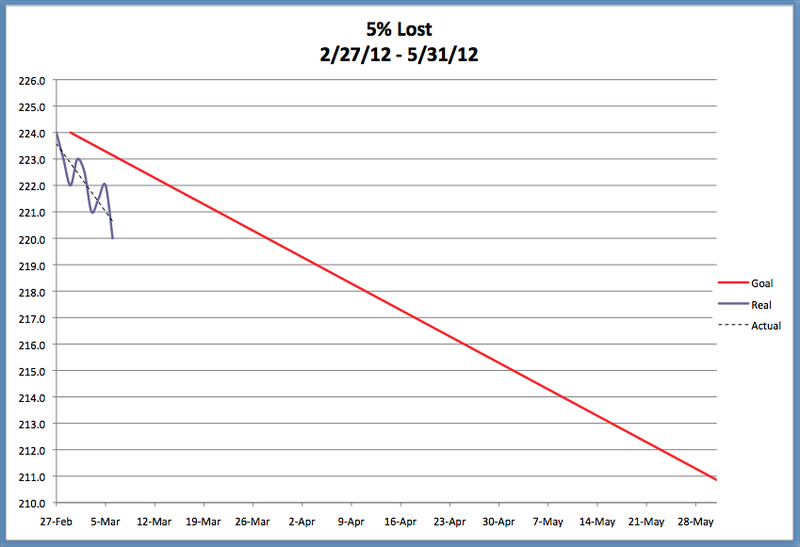 That loss may be due to me biking the last two days, and also giving up booze for Lent. I'm still rehabbing my knee from surgery in December and am only supposed to increase my time on the bike by 10% with each outing. So yesterday I did 30 minutes and today was supposed to be 33, which didn't exactly happen. 33 minutes turned into 40 because my math was wrong and I took a scenic detour at the turn-around point. But I don't think it's a big deal because I most definitely spent a good 3 - 4 minutes cruising on the downhills without using my legs at all. The days have been so nice that it's really hard not to be outside, which makes getting on the bike not all that difficult. Actually, that's a lie. Today was (and still is) equally as gorgeous as yesterday but I was most definitely going to bail because I just didn't feel like going. Then I checked the weather and it's supposed to be cold and snowy the next couple of days, so that was enough to knock the "Oh, I'll just go tomorrow" thoughts out of my head. Luckily, it's supposed to return to mid- to high-60s by the weekend. I'm stoked! Now I just need to get my eating in order and this weight-loss thing will be a piece of cake.